My childhood friend and I played at being Jack London and George Serling when we were thirteen. Bill and I used to go camping on Mount Tamalpais each summer. I took Rena here. By a waterfall she became my muse, my model for things to come, and for things the way they should be. Rena and I camped for about fifty days on a mount overlooking Monte Rio where we would swim almost every day. There were Grove Goers on the beach, waiting for the greatest ritual, when Rena took off her halter-top and cut-off blue-jeans and walked into the water. 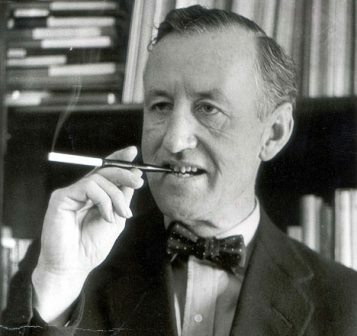 Ian Fleming is in my Bohemian Family Tree, that is now the Premiere Tree. I own CALIFORNIABARRELCOMPANY.COM This company was owned by Frederick Koster who was a member of the Bohemian Club, as was his son. Everything must be reborn. Only the one who has been reborn, knows this – for sure! 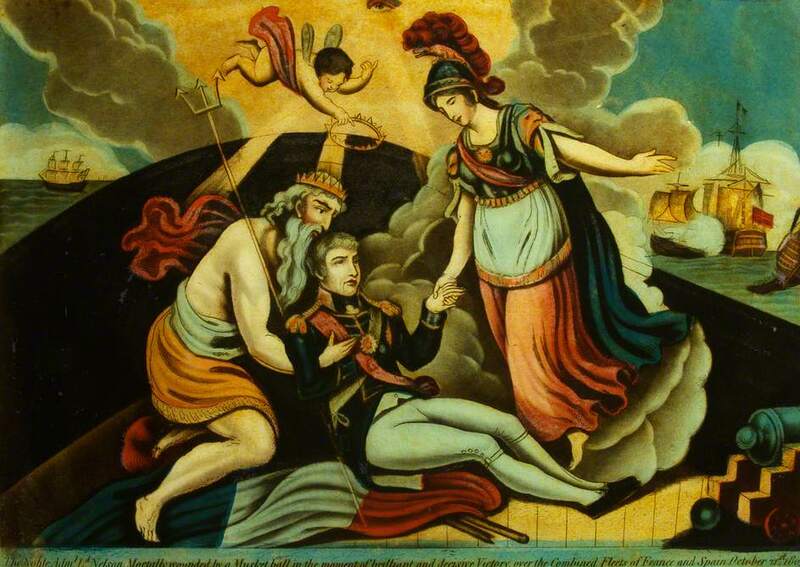 Below is an image of my ancestors on the floor of Saint Geroge’s Cathedral. When the Satanic followers of John Dee and the Rosenbergs saw this, they tried to sever all genealogical connections to Reverend William Wilson, who appears in the Scarlet Letter. The Pope has called a meeting of the Cardinals in order to save the Catholic Church, a clot who blocks the Artery of God! Note the man sitting at the base of the tree, with pen, ready to write the next NAME. This is reality! Brown is fictional. I am the Rose Blood Line! Dan Brown is a grave robber! When Princess Diana’s sons got married, the bones of my grandfather were not too far away, they buried in the floor of Saint George’s Cathedral. Sarah Wilson was the wife of John Roseman. Sarah is kin to Reverend William Wilson, who is Royal Rosamond’s 10th. grandfather. This line goes to Rosamond Clifford. Alas I have found her! We are in the same rosy family tree, and is the famous Puritan, John Wilson. I was destined for the church. It is in my blood. I have been saying this all along. William, his son John, and I have the long faces with aquiline noses. This is the oldest image of a relative. Elizabeth Rosemond Taylor, should have played Fair Rosamond. The wife of Ralph de Toney was said to have had purple eyes. I will now be using my full name so my Rosamond kindred and I can be found. Rena had graduated from high school, and was looking to go on adventure. Her grandmother did not have the money to send her to Europe, so she set out on a Road Trip with her boyfriend. After I rescued Andromeda from the Sea Monster, I took her North, into the California Redwoods. I showed Rena the Giant Sequoia on our way to the Russian River. Having an alcoholic father, I don’t think Rena was ever sent away to Camp. In desperate need of a place to swim I took my beautiful muse to the beach at Monte Rio. Eureka, she had found it, her perfect Summer Vacation spot. Here this straight A student could take a well deserved time-out before attending the University of Nebraska. To my chagrin, after beholding her in her bikini, she would not let me in the water with her, for in the water this Danish Mermaid found her bliss. She told me she would swim and float in the Platte River for hours. This was an abused child taking a Healing. In the water she was safe to have an out-of-body experience so she could practice coming back into her body. As I watched her from the shore, I understood this was therapy. When she came out of the water, she was even more of a goddess. My grandfather best describes Rena thirty years before she was born. Cowing most men – and women – was Rena’s specialty. For the first three days I knew her, I did nothing but cower, especially at the waterfall when I beheld a supernatural being. To behold Rena cowing beautiful Californian women, was a happening. 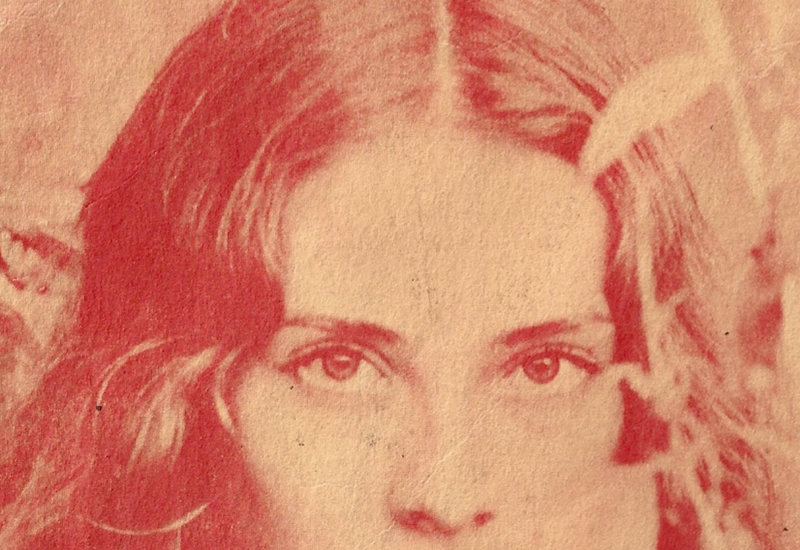 When Bill and I were thirteen, we played at being Jack London and George Sterling. We were poets and artists. We considered ourselves Bohemians. I was assigned the role of George. I did not know my grandfather’s Bohemian history. Even though he did not become famous, he rubbed shoulders with the greats. 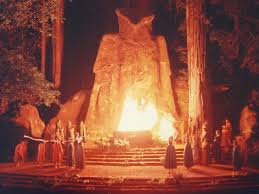 Many of these greats were co-founders of the Bohemian Grove, a Summer Camp for some of the most powerful men in the world. However, their women were not allowed to attend. Ahhhhh! While these power brokers are roughing it in a tent, carrying on like Hobos and Hillbillies, this very poor man is parading about with the most beautiful woman in the world, and, that made some folks wonder, because the rule is, wealthy men end up capturing the most beautiful – of everything! How could they not think I was something special when my 1950 cream-colored Dodge pulled into the beach parking, and once again out stepped ‘The Death’ who had a following, her own fan club! Of course I was forced to consider Rena did not want me in the water with her because this would dilute all the attention she was getting. I believe this is reason Rena apologizes to me for her being a “abusive girlfriend”. Those days at camp with my muse, were the most blissful of my life. The abuse began in ernest – when she walked out of my life! During the second half of the 19th century, the area was heavily logged. 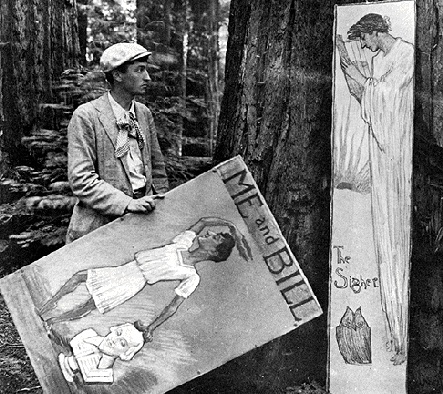 However, the Sonoma Lumber Company preserved a 160-acre (65 ha) grove of old-growth redwood trees, which was sold to San Francisco’s Bohemian Club in 1899. The club purchased dozens of other parcels in the area, and now owns 2,712 acres (1,098 ha), which it uses for its summer retreats. 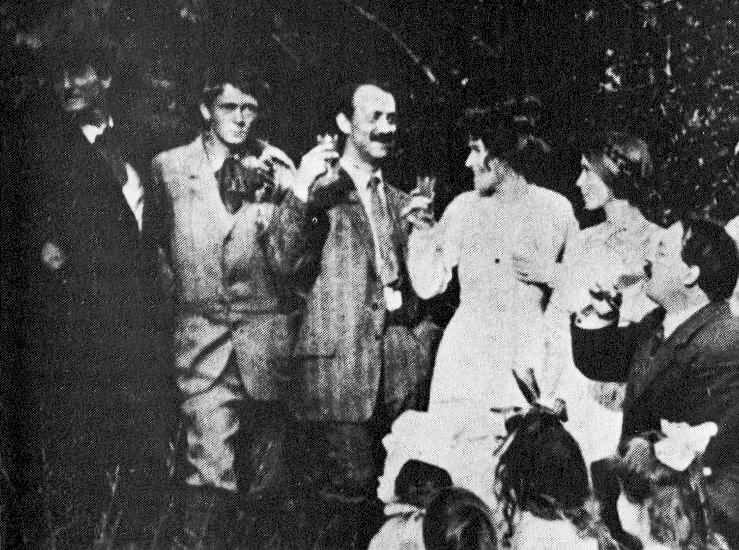 Among the authors who came to Carmel in 1906 and helped create its fame as a literary and artistic colony was James M. Hopper, the popular writer more commonly known as Jimmy Hopper. 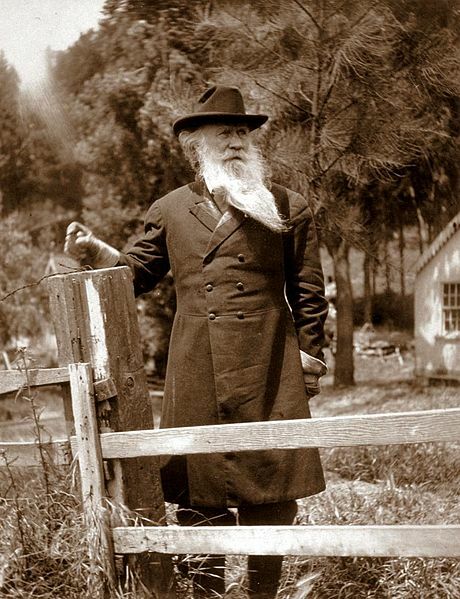 Like many of the other Carmel pioneers, he was a friend of George Sterling, Upton Sinclair, and Sinclair Lewis, and like them, too, he was a Californian only by adoption. He was born in Paris, July 23, 1876, and was brought to America at the age of ten. After attending public schools in Oakland, he went to the University of California, winning fame as quarterback on the football team and as one of the trio that reputedly first stole the Stanford Axe in 1898. After graduation he studied law at Hastings College of Law and was admitted to the California bar. But, instead of practising law, he took a job as reporter on the San Francisco Chronicle. This journalistic experience was followed by a two-year period of teaching in the Philippine Islands, where he gathered material for his first book, Caybigan (1906), a collection of’ short stories. 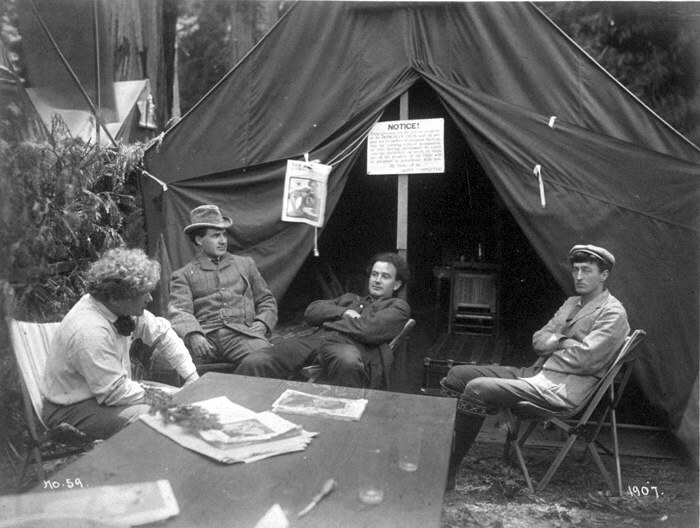 Upon his return to the United States, Hopper seriously embarked on a writing career, which he pursued successfully, with several novels, more than 400 stories published in leading popular magazines like Collier’s and the Saturday Evening Post, and nonfiction, including his syndicated articles as a foreign correspondent at the front during the first World War. Hopper lived abroad and in the East for many years, but he returned to Carmel eventually, and it was there he died in 1956. Racists in Britain are being blamed for the chaos. Bernstein claims Trump is appealing to Neo-Fascists like we see rising to power in Europe. I compared Rena Easton to Helen of Troy and suggested she was under the spell of Neo-Nazis in Montana. 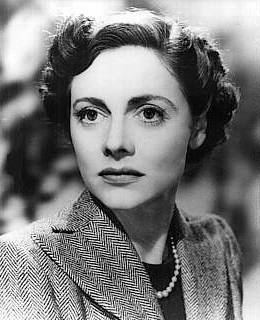 I was blogging on Sarah Churchill days before the fatal Brexit. 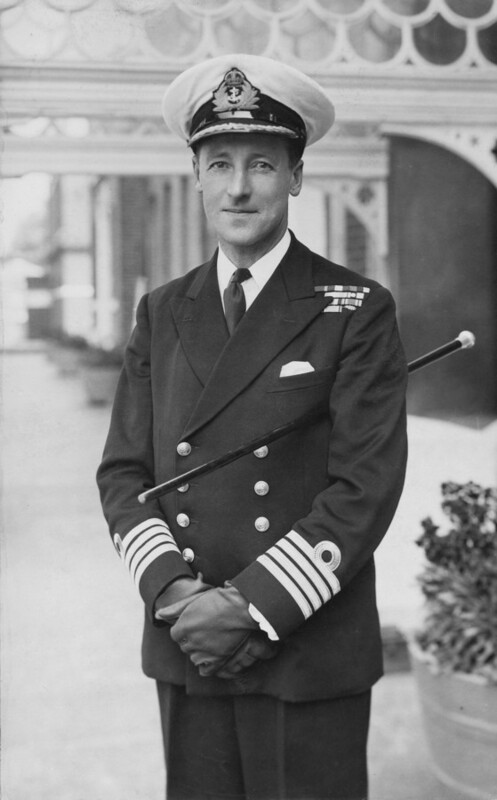 Admiral Easton was the head of the organization that Churchill founded to prevent a fall-out between Britain and the U.S. This was a special Euro agreement that very few knew exists. Was Presdient Obama informed about this vote possibly going wrong? Ian Flemming and Winston are turning over in their grave, as is Sir Easton. Who saw this great disaster coming? I did! Who was called mad, and a sexist stalker for following his prophetic works of art – and his beautiful muses? This one of the most profound love stories in the last thousand years. “In 1922 a cabinet committee under Winston Churchill, then Secretary of State for the Colonies, recommended the formation of the College. 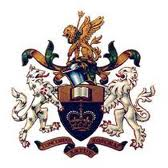 The college was founded in 1927 as the Imperial Defence College and was located at 9 Buckingham Gate until 1939. Its objective at that time was the defence of the Empire. In 1946, following the end of World War II, the college reopened at Seaford House, Belgrave Square and members of the United States forces started attending courses. It was renamed the Royal College of Defence Studies in 1970 and in 2007 the Queen and Prince Philip visited the college. The British Players arrive at the Creative Casino to play for all the marbles. 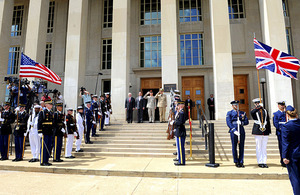 Sir Ian Easton was the head of College of Defence Studies in Washington where I believe he met Rena. It appears Ian Flemming opposed the entrance of Americans into this unit, and his Bond novels were a coded protest. I am sure he knew about Flemming’s feelings, they discussed on a regular basis, especially when the Bond movies came out. Did Ian marry Rena in hope of employing her in a real spy drama, but, she proved, difficult? It pained me to write this blog that will prove the most profound and prophetic works of art in history. What I saw in my dream was Rena’s dead daughter bidding me to rescue and take care of her mother. There was much at stake. She was speaking as Ian’s daughter. What may have alarmed Rena, is my implying her daughter took her naked form. and came into my bed in the shape of how I remember her best. Who wouldn’t? A hundred million men have longed to see an extremely beautiful woman – naked! This want is the great engine of all the battleships that have sailed around Britannia, just to keep her safe! 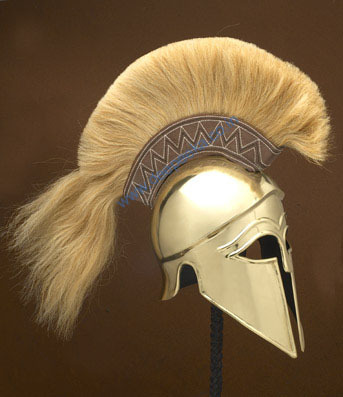 But, she take in a Trojan Horse, and, only a great love story……..will save Britannia, now! Brexit will go down in history as one of the most ugly, reactionary and regressive political campaigns ever conducted in an advanced and mature democracy. Strip away the embroidery and it is clear this was a referendum based on immigration and migrant workers, whom a large swathe of the white working class across England’s de-industrialized north have been persuaded are the source of their increasing alienation and inability to make ends meet. In conditions of severe economic depression, compounded by austerity, along with the free movement of people that is a condition of the single market, the archetypal perfect storm was in place, one that proved political manna from heaven for the right and extreme right of the British political spectrum. Placing Brexit in a wider context, it is the UK manifestation of the resurgence of the far right that has and is taking place across Europe – in western Ukraine, Scandinavia, Holland, Hungary, France and Germany – such as we haven’t since the 1930s, when similar conditions of economic depression and austerity were in place. Ultra nationalism, even neo-fascism, is the result, portending an alarming retreat into national particularisms, chauvinism, and in the last analysis the elevation of racism to mainstream prominence. Meanwhile, back in the UK we now have a situation where the people of Scotland have voted for the future while the people of England have voted for the past. In response, as England prepares to sail back into the 19th century, a second referendum on Scottish independence has already been placed on the table by the leader of the SNP Nicola Sturgeon. Unlike the first referendum on independence on Scotland in 2014, which was defeated, the stakes involved in the second will be even greater. For unlike in 2014 when the primary objective of its progressive wing was to break from the status quo of neoliberalism, the second will involve breaking from an even more grievous status quo of xenophobia and ugly British nationalism, erected as a monument to the country’s colonial past. I am going to paint Rena Victoria Easton as Britannia. How perfect! When I’m done, I will see if any of my titled friends on facebook want to purchase it. I will make posters for the Brits to enjoy. Who knows, William Windsor may want it on his wall in order to honor his beautiful wife. Rena has the most beautifully shaped almond eyes like we see on the Corinthian helmut – that would look great on her. Now we put a spear in her raised hand – and problem solved! 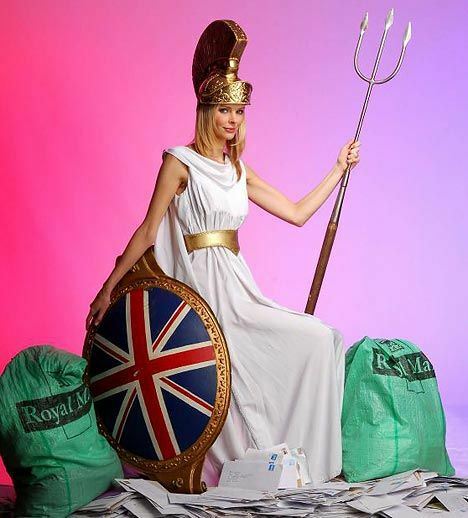 All the images of Britannia are of Cutsie-pie girls that you would chase through a garden after you had a cup of tea. The image of Rena looks like she wants to – tear your heart out. She is capable of this. One reason Rena has not come forth, because she is now a wrinkly old sea hag, and wants me to be inspired by the young beauty she was. I do wish she would send me old photos via e-mail- for Art’s sake! 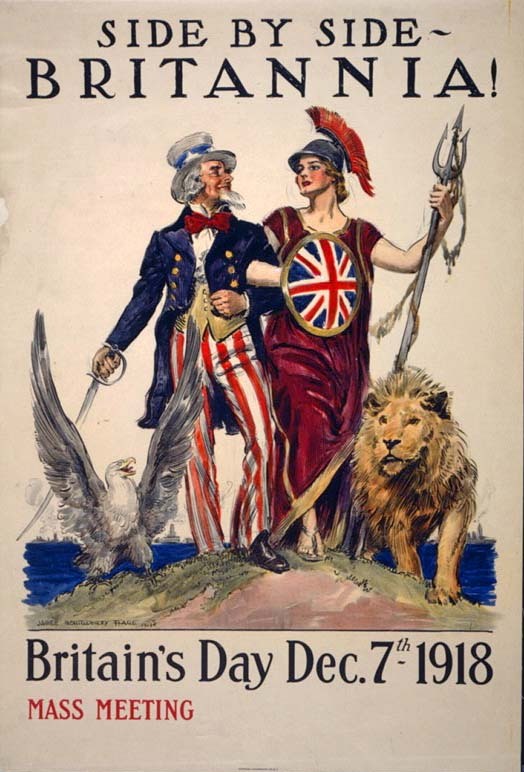 I like that poster of old Uncle Sam with Britannia. Perhaps I will make a Britannia doll with accessories. Rena is going to love this painting because she considered what her life would be like if she born male. She saw how unfair it is to be born a woman. Shall we go back to the Museum now, where Rena posed as Diana, the Goddess of the Hunt? Perhaps I am Neptune – the Old Man of the Sea? Come to me my beautiful Muse. Be by my side as I render you to music. I love the Sea Symphony, and Ionathan Livingston Seagull. You can make me a cup of tea, come to me from the kitchen in your walker and old ladies shawl as I thrash about the studio throwing color and hunks of clay around! You can wipe my creative brow, and pop crumpets in my mouth. Your life with a true artist – true to you – could be so grand! The Latin name Britannia long survived the Roman withdrawal from Britain in the 5th century, and yielded the name for the island in most European and various other languages, including the English Britain and the modern Welsh Prydain. After centuries of declining use, the Latin form was revived during the English Renaissance as a rhetorical evocation of a British national identity. 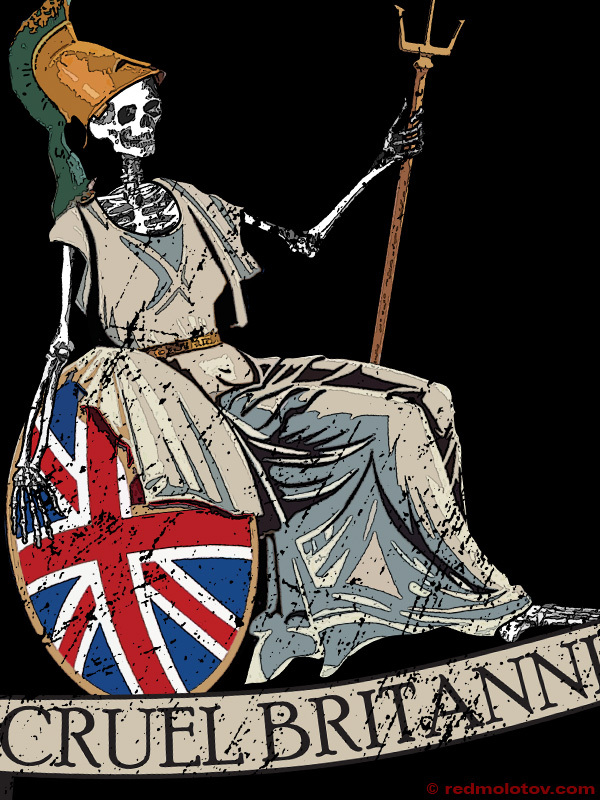 Especially following the Acts of Union in 1707, which joined the Kingdoms of England and Scotland, the personification of the martial Britannia was used as an emblem of British imperial power and unity. She featured on all modern British coinage series until the redesign in 2008. The first writer to use a form of the name was the Greek explorer and geographer Pytheas in the 4th century BC. Pytheas referred to Prettanike or Brettaniai, a group of islands off the coast of North-Western Europe. 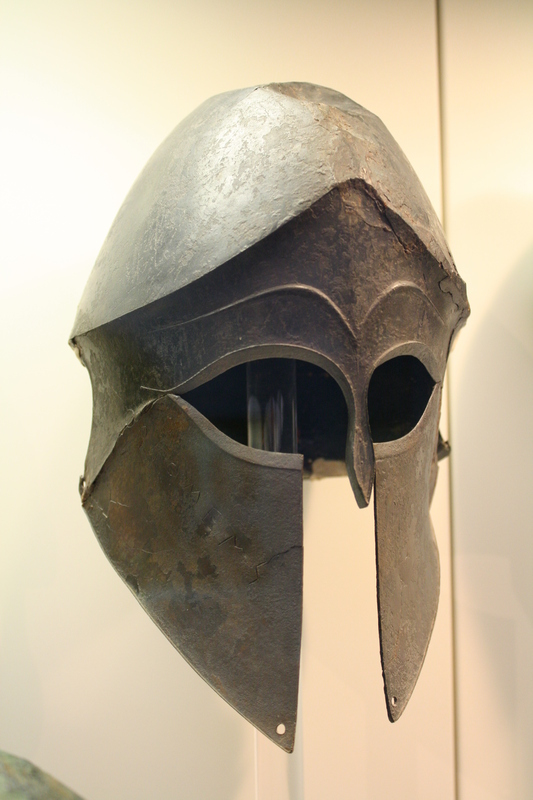 In the 1st century BC Diodorus Siculus referred to Pretannia, a rendering of the indigenous name for the Pretani people whom the Greeks believed to inhabit the British Isles. Following the Greek usage, the Romans referred to the Insulae Britannicae in the plural, consisting of Albion (Great Britain), Hibernia (Ireland), Thule (possibly Iceland) and many smaller islands. 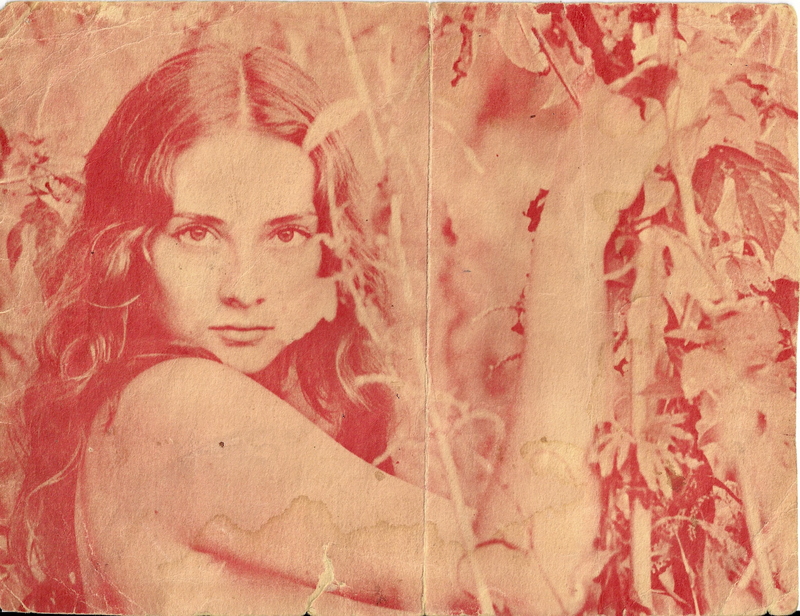 Over time, Albion specifically came to be known as Britannia, and the name for the group was subsequently dropped. That island was first invaded by Julius Caesar in 55 BC, and the Roman conquest of the island began in AD 43, leading to the establishment of the Roman province known as Britannia. The Romans never successfully conquered the whole island, building Hadrian’s Wall as a boundary with Caledonia, which covered roughly the territory of modern Scotland, although in fact the whole of the boundary marked by Hadrian’s Wall lies within modern-day Northern England. A southern part of what is now Scotland was occupied by the Romans for about 20 years in the mid-2nd century AD, keeping in place the Picts to the north of the Antonine Wall. People living in the Roman province of Britannia were called Britanni, or Britons. Ireland, inhabited by the Scoti, was never invaded and was called Hibernia. Thule, an island “six days’ sail north of Britain, and […] near the frozen sea”, possibly Iceland, was also never invaded by the Romans. The Emperor Claudius paid a visit while Britain was being conquered and was honoured with the agnomen Britannicus as if he were the conqueror; a frieze discovered at Aphrodisias in 1980 shows a bare breasted and helmeted female warrior labelled BRITANNIA, writhing in agony under the heel of the emperor. She appeared on coins issued under Hadrian, as a more regal-looking female figure. 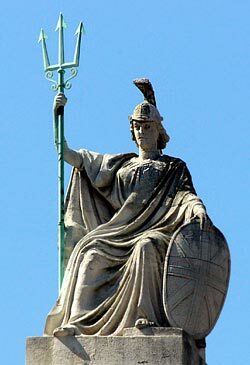 Britannia was soon personified as a goddess, looking fairly similar to the goddess Minerva. Early portraits of the goddess depict Britannia as a beautiful young woman, wearing the helmet of a centurion, and wrapped in a white garment with her right breast exposed. She is usually shown seated on a rock, holding a spear, and with a spiked shield propped beside her. Sometimes she holds a standard and leans on the shield. On another range of coinage, she is seated on a globe above waves: Britain at the edge of the (known) world. Similar coin types were also issued under Antoninus Pius. Britannia remained the Latin name for Great Britain. After the fall of the western Roman Empire, variations on the term appear in the titles of the 9th-century Historia Britonum (History of the Britons) and the 12th-century Historia Regum Britanniae (History of the Kingdoms of Britain), which became tremendously popular during the High Middle Ages. The term Britannia also came (from at least the late 6th century) to refer to the Armorican peninsula in France, because of the large-scale migration to the area by Celtic-speaking Britons. The modern French name for the area, Bretagne (“Brittany” in English) is a variant of Britannia. The term Grande Bretagne (Great Britannia, or Great Britain) has served to distinguish the island of Britain from the continental peninsula. 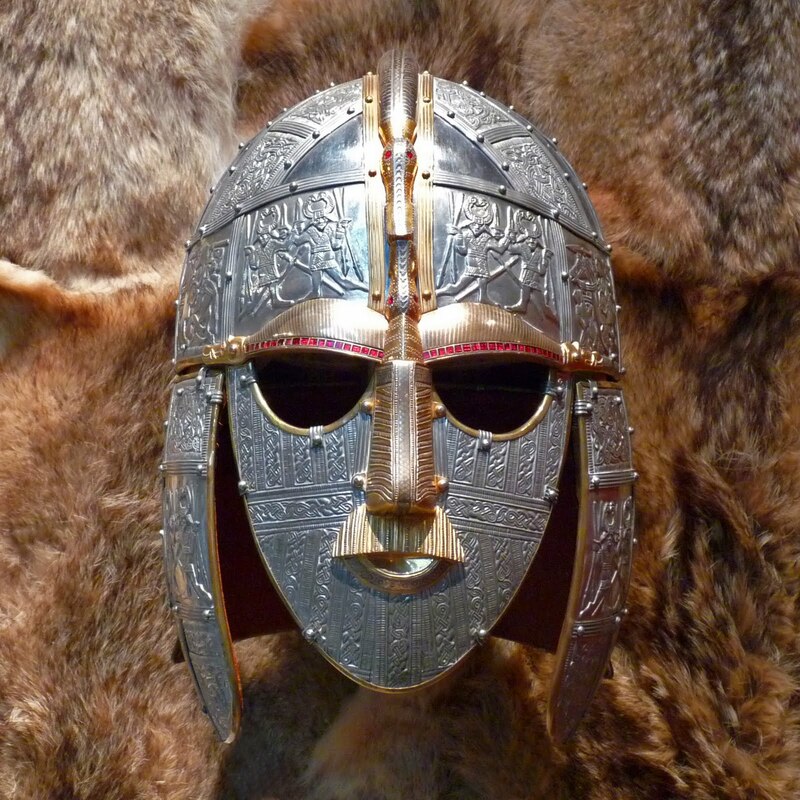 In the Medieval period it had still been common to refer only to the Brythonic Celtic inhabitants of Britain as the “Britons”, as opposed to the “English”. However, increasingly the English were included within the category of the Britons. This gained new symbolic meaning with the rise of British influence, and later the British Empire, which at its height ruled over a third of the world’s population and landmass. British power, which depended on a liberal political system and the supremacy of the navy, lent these attributes to the image of Britannia. By the time of Queen Victoria, Britannia had been renewed. Still depicted as a young woman with brown or golden hair, she kept her Corinthian helmet and her white robes, but now she held Poseidon’s three-pronged trident and often sat or stood before the ocean and tall-masted ships representing British naval power. 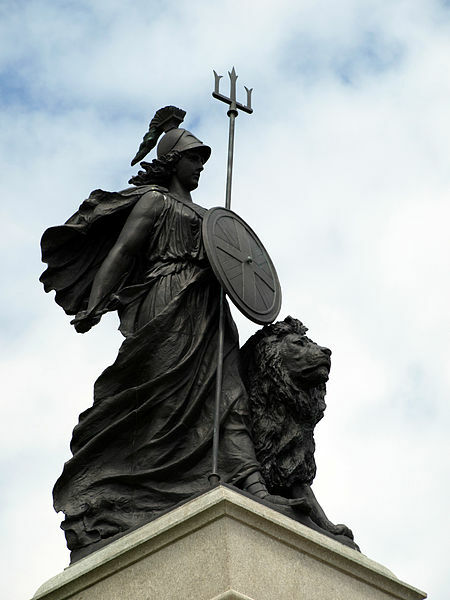 She also usually held or stood beside a Greek hoplite shield, which sported the British Union Flag: also at her feet was often the British Lion, an animal found on the arms of England, Scotland and the Prince of Wales. Neptune is shown symbolically passing his trident to Britannia in the 1847 fresco “Neptune Resigning to Britannia the Empire of the Sea” by William Dyce, a painting Victoria commissioned for her Osborne House on the Isle of Wight. New Zealanders adopted a similar personification of their country in Zealandia, Britannia’s daughter, who appeared on postage stamps at the turn of the 20th century and still features in the New Zealand Coat of Arms. 1914 Russian poster depicting the Triple Entente – Britannia (right) and Marianne (left) in the company of Mother Russia. In this depiction, Britannia’s association with the sea is provided by her holding an anchor, an attribute usually represented by Poseidon’s Trident. Perhaps the best analogy is that Britannia is to the United Kingdom and the British Empire what Marianne is to France or perhaps what Columbia is to the United States. Like Columbia, Britannia became a very potent and more common figure in times of war, and represented British liberties and democracy. 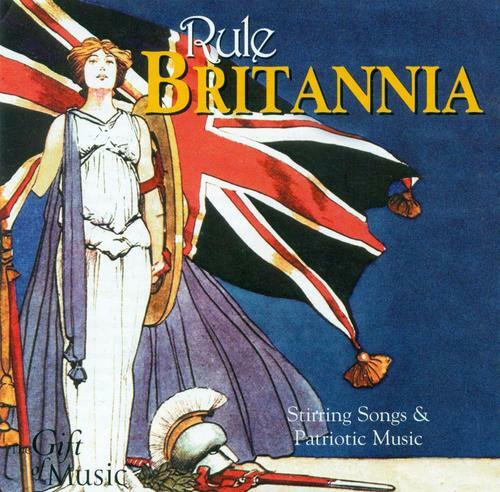 During the 1990s the term Cool Britannia (drawn from a humorous version by the Bonzo Dog Band of the song “Rule Britannia”, with words by James Thomson [1700–1748], which is often used as an unofficial national anthem), was used to describe the contemporary United Kingdom. The phrase referred to the fashionable scenes of the era, with a new generation of pop groups and style magazines, successful young fashion designers, and a surge of new restaurants and hotels. Cool Britannia represented late-1990s Britain as a fashionable place to be. Although the archetypical image of Britannia seated on a shield first appeared on Roman bronze coins of the 1st century AD struck under Hadrian, Britannia’s first appearance on British coinage was on the farthing in 1672, though earlier pattern versions had appeared in 1665, followed by the halfpenny later the same year. The figure of Britannia was said by Samuel Pepys to have been modelled on Frances Teresa Stuart, the future Duchess of Richmond, who was famous at the time for refusing to become the mistress of Charles II, despite the King’s strong infatuation with her. Britannia then appeared on the British halfpenny coin throughout the rest of the 17th century and thereafter until 1936. The halfpennies issued during the reign of Queen Anne have Britannia closely resembling the queen herself. When the Bank of England was granted a charter in 1694, the directors decided within days that the device for their official seal should represent ‘Brittannia sitting on looking on a Bank of Mony’ (sic). Britannia also appeared on the penny coin between 1797 and 1970, occasional issues such as the fourpence under William IV between 1836 and 1837, and on the 50 pence coin between 1969 and 2008. See “External Links” below for examples of all these coins and others. In the spring of 2008, the Royal Mint unveiled new coin designs “reflecting a more modern twenty-first century Britain” which nowhere featured the image of Britannia. This decision courted some controversy, with tabloid press campaigns, in particular that of the Daily Mail, launched to “save Britannia”. The government has pointed out, however, that earlier-design 50p coins will remain in circulation for the foreseeable future.